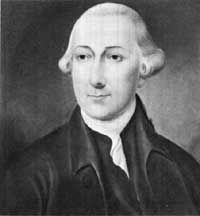 Joseph Hewes was born near Kingston, in New Jersey, in the year 1730. His parents were Aaron and Providence Hewes, who were members of the Society of Friends, and who originally belonged to the colony of Connecticut. They were induced, however, to remove from New England, on account of the prejudices which existed among the descendants of the Puritans against those who adopted the Quaker dress, or professed the Quaker faith. At the period of their removal, many parts of New England were suffering from the frequent hostilities of the Indians, who, roving through the forests in their vicinity, often made sudden incursions upon the inhabitants of those colonies, and generally marked their route with the most shocking barbarities. The murderous spirit of the Indians was also, at this time, much inflamed by an act of the government of Massachusetts, which had increased the premium on Indian scalps and Indian prisoners to a hundred pounds for each. By way of retaliation, the Indians often made their sanguinary incursions into the territory of Massachusetts, and not infrequently extended their journeys among the inoffensive farmers of Connecticut. Hence, many of the latter, desirous of a more quiet and secure life, were induced to seek a permanent residence in the remoter parts of the country. Among those who thus fled from the annoyance of prejudice, and from the deeper wrath of a savage foe, were the parents of Joseph Hewes. But even in their flight they narrowly escaped the death which they wished to avoid. On passing the Housatonic River, a party of the Indians came so nearly upon them, that Mrs. Hewes was wounded in the neck by a ball shot from the gun of a savage. In New Jersey, however, where they at length arrived, they found a peaceful and secure home. Here, some time after their settlement, their son Joseph Hewes was born. Of the incidents of his younger days we know but little. At a proper age he became a member of Princeton College, from which, having graduated in due course, he was placed in the counting-house of a gentleman at Philadelphia, to be educated as a merchant. On leaving the counting-house of his employer, he entered into the mercantile business for himself, and soon became an active and thrifty merchant. At the age of thirty he removed to North Carolina, and settled in the village of Edenton. The same prosperity which had attended him at Philadelphia, followed him to a more southern province, and in a few years he acquired a handsome fortune. Mr. Hewes, both before and after his removal to North Carolina, sustained the reputation of a man of probity and honor. He acquired the confidence and esteem of the people among whom he lived, and was soon called to represent them in the colonial legislature of the province. This distinction was conferred upon him for several successive years, with increasing usefulness to his constituents, and increasing credit to himself. At length, in the year 1774, a congress, well known in the annals of the American colonies, assembled in Philadelphia. In that body were three delegates from North Carolina, of whom Mr. Hewes was one. The instructions and powers given to the delegates of this congress by the people of the several colonies, were considerably diversified. No public body, at that time, contemplated a separation from the mother country, and with no powers to this effect were any of the delegates to the congress of 1774 invested. Their object respected the means most proper to restore harmony between themselves and Great Britain, to obtain redress of grievances which the colonies suffered, and to secure to them the peaceful enjoyment of their unalienable rights, as British subjects. No delegates to this congress carried with them credentials of a bolder stamp, than those from North Carolina. They were invested with such powers as might "make any acts done by them, or consent given in behalf of this province, obligatory in honor upon any inhabitant thereof, who is not an alien to his country's good, and an apostate to the liberties of America." On the meeting of this congress, two important committees were appointed; the one, to "state the rights of the colonies in general, the several instances in which these rights are violated or infringed, and the means most proper to be pursued for obtaining a restoration of them;" the other, to "examine and report the several statutes which affect the trade and manufactures of the colonies." Of the former of these committees, Mr. Hewes was appointed a member, and assisted in preparing their celebrated report. "1. That they are entitled to life, liberty, and property; and they have never ceded to any sovereign power whatever a right to dispose of either, without their consent. "2. That our ancestors, who first settled these colonies, were, at the time of their emigration from the mother country, entitled to all the rights, liberties, and immunities of free and natural born subjects, within the realm of England. "3. That by such emigration they by no means forfeited, surrendered, or lost, any of those rights; but that they were, and their descendants now are, entitled to the exercise and enjoyment of all such of them as their local and other circumstances enable them to exercise and enjoy. "4. That the foundation of English liberty, and of free government, is a right in the people to participate in their legislative council; and as the English colonists are not represented, and, from their local and other circumstances, cannot properly be represented in the British parliament, they are entitled to a free and exclusive power of legislation in their several provincial legislatures, where their right of representation can alone be pursued in all cases of taxation and internal polity, subject only to the negative of their sovereign, in such manner as has been heretofore used and accustomed; but if from the necessity of the case, and a regard to the mutual interests of both countries, we cheerfully consent to the operation of such acts of the British parliament as are bona fide restrained to the regulation of our external commerce, for the purpose of securing the commercial advantages of the whole empire to the mother country, and the commercial benefit of its respective members; excluding every idea of taxation, internal or external, for raising a revenue on the subjects in America, without their consent. "5. That the respective colonies are entitled to the common law of England, and, more especially, to the great and inestimable privilege of being tried by their peers of the vicinage, according to the course of that law. "6. That they are entitled to the benefit of such of the English statutes as existed at the time of their colonization, and which they have, by experience, respectively found applicable to their several local and other circumstances. "7. That these his majesty's colonies are likewise entitled to all the immunities and privileges granted and confirmed to them by royal charters, or secured by their several codes of provincial laws. "8. That they have a right peaceably to assemble, consider of their grievances, and petition the king; and that all prosecutions, prohibitory proclamations, and commitments for the same, are illegal. "9. That the keeping a standing army in these colonies in times of peace, without consent of the legislature of that colony in which such army is kept, is against the law. "10. It is indispensably necessary to good government, and rendered essential by the English constitution, that the constituent branches of the legislature be independent of each other; and therefore the exercise of legislative power in several colonies by a council appointed during pleasure by the crown, is unconstitutional, dangerous, and destructive to the freedom of American legislation. "All and each of which the aforesaid deputies, in behalf of themselves and their constituents, do claim, demand, and insist on, as their indisputable rights and liberties, which cannot be legally taken from them, altered, or abridged, by any power whatever, without their consent, by their representatives in their several provincial legislatures." "To these grievous acts and measures, Americans cannot submit; but in hopes their fellow subjects in Great Britain will, on a revision of them, restore us to that state in which both countries found happiness and prosperity, we have, for the present, only resolved to pursue the following peaceable measures: 1. To enter into a non-importation, non-consumption, and non-exportation agreement, or association. 2. To prepare all address to the people of Great Britain, and a memorial to the inhabitants of British America. And, 3. to prepare a loyal address to his majesty, agreeably to resolutions already entered into." Few measures adopted by any session of congress during the revolutionary struggle, were more remarkable than that of the congress of 1774, which recommended the system of non-importation. It was a measure dictated by the highest patriotism, and proceeded upon the acknowledged fact, that the same exalted patriotism which existed among them, existed, also, among the American people. The efficiency of the measure, it was obvious, must lie in the union of the people to support it. They must adopt and persevere in a system of privation. A willingness to do this generally prevailed throughout the colonies; and to the government of Great Britain was presented the spectacle of thirteen colonies adopting a measure, novel, perhaps, in the history of the world, and supporting it at the sacrifice of a great portion of those comforts which they had been accustomed to enjoy. Although a merchant, and one who had been engaged in commercial transactions with England for the space of twenty years, Mr. Hewes cheerfully assisted in forming a plan of the non-importation association, and most readily became a member of it. The manner in which Mr. Hewes had acquitted himself during the session of this congress, was so acceptable to the people of North Carolina, that he was again appointed to the same high office, and in the month of May, 1775, again appeared at Philadelphia, and continued in congress until the adjournment of that body, on the last day of July. During the recess of congress, between July and September, he made a visit to his friends in New Jersey, and in the latter month again resumed his place. From this date until the twenty-ninth of October, 1779, Mr. Hewes continued to represent the state of North Carolina, with the exception of something more than a year, during which he devoted himself to hie private affairs, and to the interests of his state at home. The last time that he appeared in congress was on the twenty-ninth of October, of the year last mentioned, after which, an indisposition under which he had labored for some time confined him to his chamber, and at length, on the tenth of November, terminated his life, in the fiftieth year of his age. His funeral was attended on the following day by congress, by the general assembly of Pennsylvania, the president and supreme executive council, the minister plenipotentiary of France, and a numerous assemblage of citizens. In testimony of their respect for his memory, congress resolved to wear a crape around the left arm, and to continue in mourning for the space of one month. Although the events in the life of Mr. Hewes, which we have been able to collect, are few, they perhaps sufficiently speak his worth, as a man of integrity, firmness, and ardent patriotism. To this may be added, that in personal appearance he was prepossessing, and characterized in respect to his disposition for great benevolence, and in respect to his manners for great amenity. He left a large fortune, but no children to inherit it.